“Bartleby’s Book of Buttons Vol. 1: The Far Away Island” [iTunes Link] is a new iPad application for kids (and playful adults) that embraces everything that makes the Apple device special. It’s a kind of “digital pop-up book” that engages readers in ways that no dead tree could, and it was born right here in Hawaii. I was eager to learn the history of the app, and to try it out. And if you comment on this post, you could win a free copy of “Bartleby’s” for your iPad. Details below. “Bartleby’s” is the brainchild of local artist and sculptor Henrik Van Ryzin and his wife Denise, a geek and entrepreneur. Henrik was born and raised in Kailua, and worked as a special effects artist in Hollywood before returning to the islands. The pair created the app under the banner of Octopus Kite, the iPhone division of their design firm, Big D.
Denise said “Bartleby’s” was something they’d been dreaming about for a long time. Denise said that she and Henrik had almost everything they needed to make it happen: game concept, design, art, illustration, flow, UI, animation and sound effects were all covered. But the missing ingredient only emerged when they attended the Macworld conference earlier this year: Kyle Kinkade. Kinkade is president of app development firm Monster Costume, but is likely best known for his work at Tapulous, including designing its blockbuster game Tap Tap Revenge. That was seven months ago. Kyle’s entire crew of four developers worked 60-80 hour weeks to build the app. One of them focused entirely on the game’s physics. To get things done, there were countless iChats, FaceTime calls, and one more in-person meeting in Seattle. The last piece was the music, which was done by Honolulu’s own Kit Ebersbach of Don Tiki. “Bartleby’s Book of Buttons” hit the Apple app store on Aug. 6, priced at $4.99. It was soon featured in the store as “New and Notable,” and just this week, climbed as high as #8 among the store’s top paid book apps, ahead of Disney’s “Toy Story 3” digital book. Denise was kind enough to provide me a promo code so I could try it out. Or rather, so my youngest son Alex, age five, could try it out. “Bartleby’s” is simple, elegant, and clever. In book terms, it’s essentially eight pages of gorgeous illustrations. But it’s the interactive element, the puzzle pieces, that makes the magic. Bartleby is a bald, mustached globetrotter in a bowler hat and a trench coat who could be a relative of Rich Uncle Pennybags. He lives in a colorful, crisp world with brass and wooden touches that have a kind of steampunk Winnie the Pooh vibe. 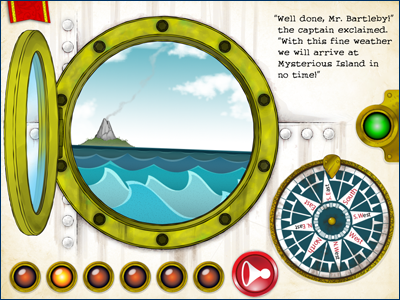 Our protagonist sets sail aboard the H.M.S. Adventure for Mystery Island to add a button to his collection, and each step of his journey offers a light brain-twisting puzzle to get to the next. The app takes advantage of every aspect of the intuitive iPad interface. To flip switches or turn dials or make things happen, you tap and slide your finger across the screen, tilt the whole device from right to left, or spin it in space. And even if you can’t figure out the trick to turn the page (or don’t want to), there’s a lot packed into each screen to admire and play with. I played with “Bartleby’s Book of Buttons” for a while before getting stuck on “The Open Sea,” the fourth page. My son, of course, figured it out for me after only a few minutes of pondering and thinking outside of the box. I then watched as he made his way to the end, reaching the last page in about an hour. Fortunately, although he had finished the story, he wanted to read it again. Or, I should say, he wanted to play it again. And once you’ve unlocked all the pages, you can jump straight to your favorite pages. He remained engrossed in the app for most of the afternoon, and took great glee in introducing his older brother and sister to it. “Bartleby’s Book of Buttons” is great for young kids, and a great-looking showcase of the iPad’s tricks for adults. The only hint I’ll offer to newcomers is that you should actually read the story, which offer hints for each puzzle. $4.99 sounds a bit pricey for an eight-page story, but the degree of polish here, in both design and physics, is impressive. The app is subtitled “Volume I: The Far Away Island.” So my kids and I are looking forward to the next chapter! You can download “Bartleby’s Book of Buttons” via iTunes here. But if you comment on this post by Friday, Aug. 18, you could win a free copy win one of two free copies of the app, courtesy Octopus Kite! Of course, you’ll need an iPad and an iTunes account to redeem your prize. UPDATE (Aug. 19): The app is now on sale for $1.99, more than half off the regular price of $4.99. The cost was perhaps my main gripe, so now “Bartleby’s” is practically perfect. It’s a “five-day fire sale” to celebrate being featured by Apple. Grab it while you can! Thanks for a wonderfully written review Ryan! We are working on Vol 2: The Button at the Bottom of the Sea and we may add a few pages to Vol 1. Hopefully they will be hitting the app store in the next few months if not sooner! Wow! Great review. Makes me want it for myself. My niece would love the app! Great review! This looks like such a great app! My kids would adore it! This article caught my attention as soon as it mentioned pop up. Love pop up books! However as parent and a teacher I love anything that gets students interested in reading. And as I truly believe e books are the future getting kids to read on a device like iPad is even mire a plus. Something I have been trying to get my own child to do! So I love this idea for an ap! Way to go! What a wonderful review. I’m always looking for some new and interesting apps. Thank you for taking the time to walk us through. I also appreciated learning more about the developers as I often find if I enjoy one of their apps, I like to support their work and purchase more from them. It sounds very immersive and myst like. Pretty awesome app. Good for keeping kids entertained on a plane ride? Denise and Brian, you’re our winners! I’ll be in touch! I’m 6 year old. I like to read Bartleby’s book of buttons very much. I can’t wait for volume 2. Thank you for the wonderful book. I reached this review after running a google search on Bartleby’s Buttons – Stuck. As much as I wanted to love this App, I think some basic things have been overlooked. We are simply not able to proceed past the fourth page, like the reviewer, and we don’t have a nifty five year old to solve the puzzle for us. There is no option to simply read-through the story without solving the puzzles, which leaves us with an unreadable book and a very disappointed four year old. I tried contacting the developer for assistance, but received no response. If anyone reads this and is willing to provide a walk-through to solve page 4, we would be most grateful. Based on this experience, we would not rush to purchase further apps from this developer. Learning should be fun, not frustrating. Aloha Bronwyn – I did get your email (today) and have been traveling and unable to repond. Please check your email for assistance. Bartleby is designed to be a reading/story-time experience. Not a “reader” and we do note this in the description of the app. Great app! My 19 month old loves it, especially the 2nd page with the train. Looking forward to Vol. 2.